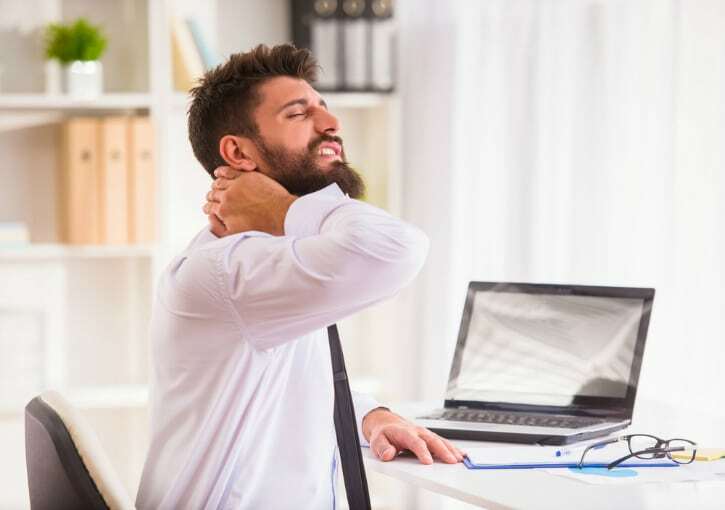 As more and more of us hit the office chairs for long hours of the day, be it at a new job or a return to college, neck pain is on the rise and we are seeing more and more people coming through our doors seeking our help. Although there are numerous causes of neck pain from trauma to arthritic changes, there are some simple things that we can do to reduce the level and frequency of neck pain. The human body is designed to move and it doesn’t particularly like sitting for in one position for hours on end There are many synovial joints in the neck and like your knees, they require movement in order to feed nutrients to the tissues and remove wastes. Ever feel knee stiffness from sitting in the car too long? Your neck is no different! So one of our big pointers is to consciously make an effort to stand out of your chair evert hour and move your neck, shoulders and lower back. We often advice our patients to put something like a sticker or a small toy on top of your desktop monitor. When it catches your attention it acts as your movement coach and tells you to get moving. Why not give it a try? Many people believe that poor posture is the route cause of their pain. Yes, sitting in a slouched position can put your muscles in a disadvantaged position and reduce their effectiveness at doing their job which include keeping you sitting upright against gravity and also moving your neck and shoulders to type. Again trying to move more regularly can help reduce the aches and pains and also trying to sit into your chair a but more can help too. If you are a chronic sloucher, why not advise people around you to remind you to sit upright when you do slouch! Nothing beats a team approach so return the favour on them! Why not try a standing desk? Many of the new offices being built across the country come with adjustable standing desks. Why not try stand and work for a while? Again, if we stood all day on the spot we would see a different type of pain presenting through our doors, so the advice again would be to alternate throughout the day with sitting and standing. One of the most effective methods of keeping the pain at bay is to challenge your muscles. Are the muscles fit for the job at hand? Do you get regular pain? Strengthening and improving muscular endurance is one of the best methods at reducing your neck pain and can also help you to tone up in around the shoulders, arms and back too. Two simple exercises to start with are the resistance band row and the desk top push up. For the row, you will need to purchase a lightweight resistance band and you can take this to the office. Simply loop the band around a table leg or even your own foot and pull it to you. Simple and effective. The second exercise is to do some push ups on your desk and kitchen counter at home. These are gentle and easy to perform exercises. So why not give them a try. If you cant beat the pain and it is getting more advanced, why not give us a call, we would love to help relieve your discomfort and get you back to working full painfree days. This entry was posted in Blog and tagged desk job, neck pain, posture. Marathon runners: Don’t let Achilles pain spoil your race day!